This article was originally written as the March 2005 Featured Stein for Stein Collectors International (SCI). It has been modified and updated for this site. The March 2005 Featured Stein is a Jugendstil stein made by Dümler and Breiden of Höhr, Germany. Höhr joined Grenzhausen and Grenzau to form the city of Höhr-Grenzhausen in 1936. Jugendstil is the German version of art nouveau (see the Reading Room section of the SCI web site for more information on the Jugendstil style, “A Pictorial Essay of Jugendstil Steins”). Most of the information on this firm was obtained from the sources listed in references 1 through 3 below. 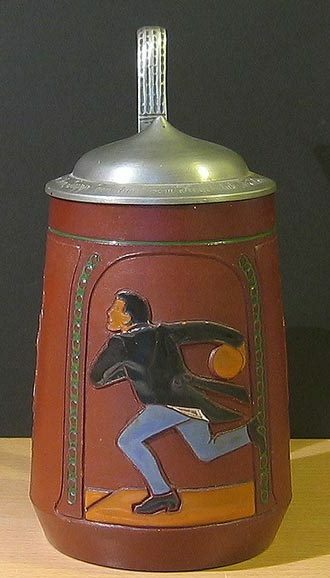 This Dümler and Breiden stein features a bowling scene. Quick now, how many pins went down with that strike, nine or ten? If you said ten, you are not living in the past. But back in the late 19th century, particularly in Germany, it was a game of nine pins. As a matter of fact, that was the game Rip Van Winkle saw the ghosts of Henry Hudson’s crew playing before his twenty-year nap (see reference 4). The inset lids of Mettlach bowling steins usually feature the layout of nine pins in the shape of a baseball diamond (see photo). The early Germans used to carry a pin, called a kegel, for defensive purposes. The monks used it in nine pin as the head-pin target and encouraged the parishioners to knock down the devil. That is how we got the name kegler and kegling. Some of the eBay listings call these scenes skittle, but that is the English game and these are definitely German steins and the German game. 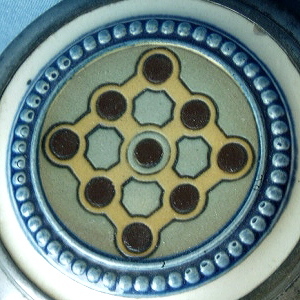 V & B Mettlach inlaid lid showing the pin arrangement in the game of nine pins. We started out playing nine pins in the United States too, but betting on the sport caused the nine pin game to be declared illegal. Luckily they also had lawyers back then and one supposedly came up with a loophole to the law by just adding one pin. And that was how we got today’s ten pin game. Golf steins lead the sports themed steins as far as premium pricing goes thanks to well-heeled golfers (they will buy anything golf related). Sports Illustrated once ran an article on a golf related stein collection in their November 8, 1954 issue (that was pre-swimsuit issues, but it still did not make the cover). Bowling steins, on the other hand, are one of the least expensive of the sports themed steins. Bowling is a bare-bones sport; you can rent the shoes and the ball and other equipment are provided by the bowling alley. While bowlers are well known beer drinkers, walk in any bowling alley and you will see bowlers knocking them down faster than the pins can fall, they prefer their beer straight out of the can or bottle. Nevertheless, The International Bowling Museum and Hall of Fame in St. Louis, Missouri (across from Busch Stadium) features some Mettlach steins in their display (see reference 5 for information on bowling, sorry but there is nothing on steins). I know about bowling as I joined a bowling league right after I graduated from high school. I once had a 226 in the first game. Unfortunately, I was unable to achieve even a 400 series as the celebration started too early. Since the statue of limitations has expired, I can confess that we used to skip high school every Thursday afternoon in my senior year to go bowling for ten cents a line at Rainbow Lanes in Fremont, Ohio. I also was an early casualty of technology having been replaced as a pin setter by the automatic pin setting machines that were introduced in the 1950s. When the Dutch brought the game to New York, they used to play it outdoors and the area became known as Bowling Green. Did I mention that I graduated from Bowling Green State University in Ohio? The more reasons you can find to collect steins, the easier it is to collect them. If you have never bowled or want to take up the sport again, try a free evaluation of Pin Action at http://www.xfusionsoftware.com/games.html, but not before you finish reading this article. Peter Dümler and Albert Breiden, founders of Dümler and Breiden, were friends from their school days, both having been born in 1860. 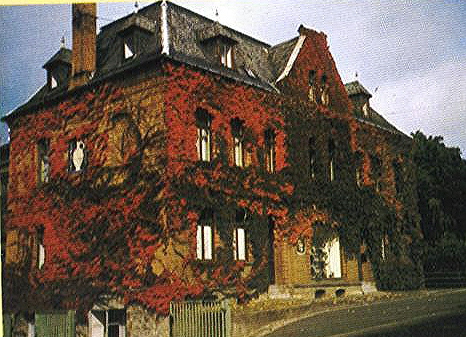 The Breiden family ran a mustard mill where they resided, which fact was used for the title of the article in reference 3 – “Müllches Albert” or Albert from the Mill (thanks to Marc Lang for assistance translating this article). The Mill was located in Grenzhausen on Brexbach Stream which is in a valley below Burg Grenzau. This is the castle with a triangular tower that was the Featured Stein in November 2003, see the Archives section for the Featured Stein at the SCI web site). Peter Dümler published a brochure on Burg Grenzau and its inhabitants. The mill was built in 1700 by Hugo von Orsbeck, Archbishop of Trier (see reference 7). A fire destroyed the mill in 1914 just before World War I. Local potters also brought clay to the mill to be crushed. As the boys grew older, both wanted to become potters, a main occupation in Höhr due to the rich deposit of clay in the Westerwald area (see reference 8 for more information on Westerwald stoneware or visit the Reading Room section of the SCI web site and read the articles “A Westerwald History” or “The Kannenbäckerland”. Albert learned the trade from his uncle, Simon Peter Gerz, learning the techniques on how to run a pottery. Peter got his training from both Reinhold Hanke and Simon Peter Gerz, preferring to use his artistic talents for the design of pottery. Peter took pride in his ability to imitate work from the 16th century and hid his initials, “PD,” in the intricate designs. They started their firm on a shoestring in 1883, when both were in their early 20s, to produce practical crockery for the home. They quickly obtained recognition by winning first prize in exhibits in both Antwerp and Koblenz in 1885. Around 1890 they started producing steins. SAME: Their partnership went beyond the business though. Albert married Peter’s sister and the two families shared the same large double house that also served as the office for the adjoining factory (see photo ▲). 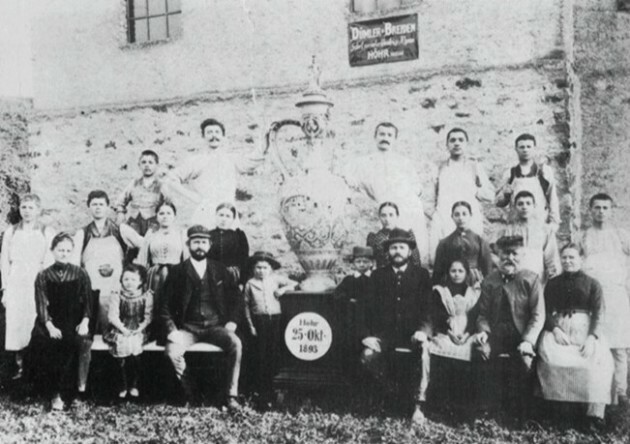 In 1893 the firm made a 2.1 meter (almost seven feet) tall stein (see photo, above center) for a brewery in Chicago. While the photograph does not identify the people, I presume that Albert is on the left (he had ten children) and Peter is on the right (he had five children). Werner Sahm of Rastal-Werk offered one of Rastal’s 1L steins as a reward to anyone who could find the location of this large stein in the June 1983 “Prosit” (SCI’s quarterly magazine). I am not sure that the reward was ever claimed or if the large stein was ever found as the March 1984 Prosit indicated the reward still was unclaimed. The firm also made a 1.3 meter high vase, which is one of the city’s landmarks (see photo▼). Since Chicago hosted the World’s Columbian Exposition of 1893, I suspect the 2.1 meter stein, which was free turned by hand, might have been displayed in the brewery exhibit. My search on the Internet was not successful, but if anyone in Chicago has access to a more thorough listing of photographs from the exposition, they may have more success. I did find a site that has some photos from the exposition and it did show some interesting photos of the brewery exhibit (see reference 9). Robert Ripley, of Ripley’s Believe It or Not fame, also was a serious collector of beer steins. The pride of his collection was a stein he claimed to be the world’s largest beer stein. It is on display at the Ripley Museum in Niagara Falls, New York, but the museum claims it only dates from the 1920s. With the death of Peter in 1907, Albert took over managing the firm along with Peter’s widow. Production of Jugendstil steins began around this time. One type of material Albert selected for this style was terra sigillata, a very smooth, lustrous coating of clay which resembles a glaze, usually red, and is virtually waterproof (see reference 10 for a site that has information on early Roman terra sigillata). According to The Encyclopedia Britannica, the Latin term literally means wares made of clay impressed with designs, while another source translates it as sealed earth. Perhaps his choice of material was influenced by the fact that Albert, his daughter Paula and his father share a common trait – they all had red hair. I furnished a photo of this stein to a ceramic instructor to get his comments (see reference 11). He had not encountered it before and thought it was an interesting piece. He opined that it appeared to be just a refined clay slip without being polished. The Roman terra sigillata wares have a high gloss finish because the terra sigillata is polished to help seal the pottery. 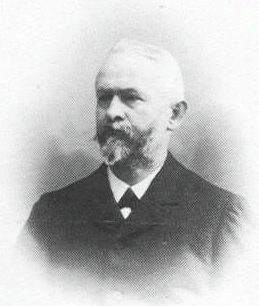 Herr Breiden died in 1926 at the age of 65. 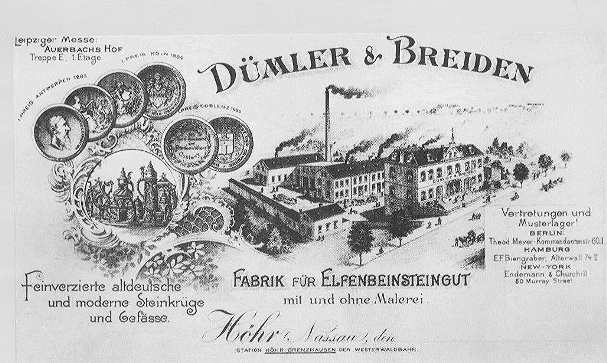 The firm of Dümler and Breiden, however, survived until sometime after its 100th anniversary in 1983. 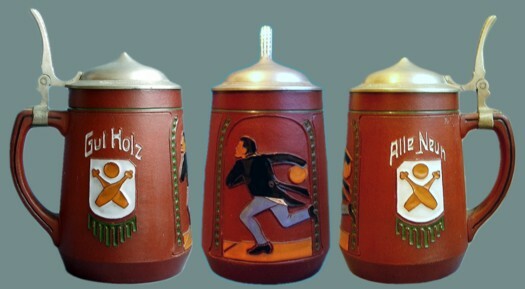 This stein has three scenes: the front shows a bowler approaching the line while the side panels have a banner with two crossed pins and a bowling ball above them. 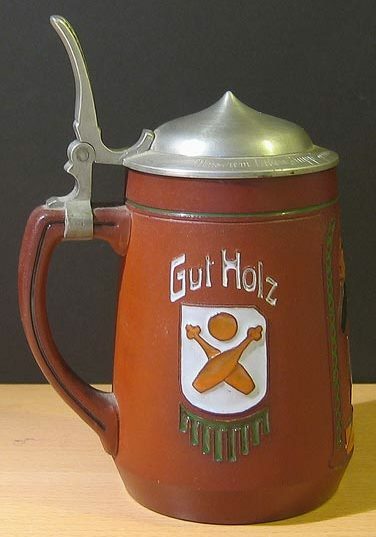 One side scene says “Gut Holz” (good wood) and the other says “Alle Neun” (all nine or a strike). 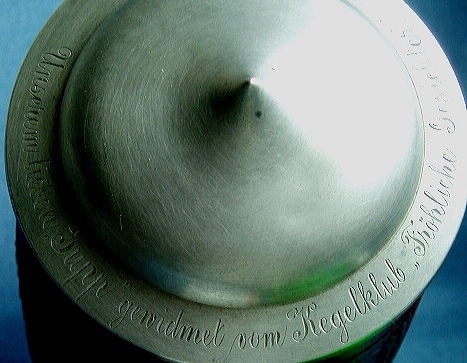 The lid is inscribed Unserem lieben “Tupp” gewidmet vom Kegelklub “Fröhliche Gesichter,” which roughly translates to “Our dear “Tupp” dedicated from the Kegel Club “happy faces.” The mark on the bottom of the stein is one of the two marks you will find on their terra sigillata steins. The other mark is a plain “T” with the “S” intertwined with the “T.” Although I could not find a specific reference to the use of these two marks, I believe they were specifically designed for the terra sigillata steins. If anyone has either of these two marks on a stein other than terra sigillata, please let us know. The other Dümler and Breiden marks are shown below. Like (the February 2005 Featured Stein by Rosskopf & Gerz, this one is also marked on the bottom with “ges. geschutzt,” which means registered design, on two lines. In this instance, however, it is in lower case letters rather than upper case letters. The mold number of this stein is 1290. My recent review of 295 stein auction catalogs, approximately 115,000 steins, revealed only 31 listings of Dümler and Breiden terra sigillata steins. Two molds had multiple listings and five listings did not identify a mold number. The mold numbers included 116, 838, 953, 972, 980 (four listings), 1033, 1181 (11 listings), 1202, 1215, 1284, 1384, 1524 and 1614. Earlier catalogs included some steins that appeared to be Dümler and Breiden terra sigillata steins, but the mark may not have been known at the time to identify them as such and I could not verify that the steins were terra sigillata due to the photos being black and white. The book in reference 3 lists an additional four molds: 939, 981, 1103 and 1032. These 19 or so terra sigillata steins would make a nice display. I am not aware of any other manufacturer of this era that made terra sigillata steins, although I did find a plain dark red clay stein by Simon Peter Gerz that may have been made after Breiden took over management of that firm. It, however, does not have the green interior of the Dümler & Breiden terra sigilatta steins. It is not so unusual to find so few of these steins however, since this is a more difficult material with which to work. 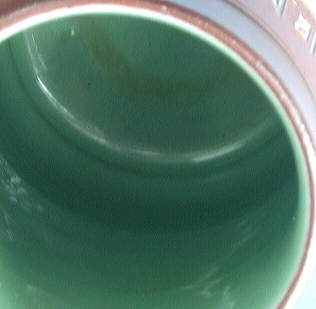 The inside of the stein has a greenish or turquoise glaze. The ceramic instructor in reference 11 stated that iron in the material could cause the glaze to be a soft green, but that copper or chrome was probably used for this rich green color. 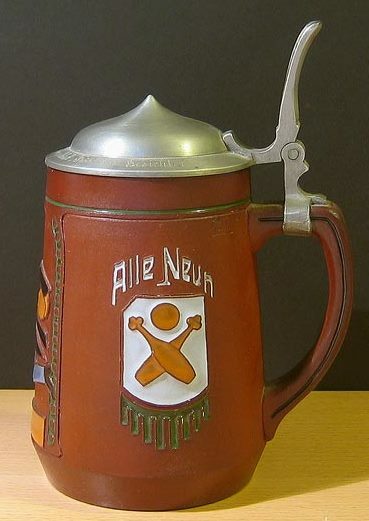 ◄ Detail of the “capacity mark” on the subject beer stein. 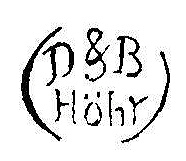 The other Dümler and Breiden marks are also shown below. Like the Rosskopf & Gerz ((Stein of the Month, Feb 2005) this one is also marked on the bottom with “ges. geschutzt,” which means registered design, on two lines. In this instance, however, it is in lower case letters rather than upper case letters. The mold number of this stein is 1290. The incised base mark seen next to the mark found in literature for terra sigillata by D&B. My recent review of 295 stein auction catalogs, approximately 115,000 steins, revealed only 31 listings of Dümler and Breiden terra sigillata steins. Two molds had multiple listings and five listings did not identify a mold number. The mold numbers included 116, 838, 953, 972, 980 (four listings), 1033, 1181 (11 listings), 1202, 1215, 1284, 1384, 1524 and 1614. Earlier catalogs included some steins that appeared to be Dümler and Breiden terra sigillata steins, but the mark may not have been known at the time to identify them as such and I could not verify that the steins were terra sigillata due to the photos being black and white. The book in reference 3 lists an additional four molds: 939, 981, 1103 and 1032. These 19 or so terra sigillata steins would make a nice display. I am not aware of any other manufacturer of this era that made terra sigillata steins. It is not so unusual to find so few of these steins however, since this is a more difficult material with which to work. 1 The “( )” indicates between, thus the first mark was used between 1883 and 1925, or 1884 to 1924. I presume the third mark was only used in 1910. 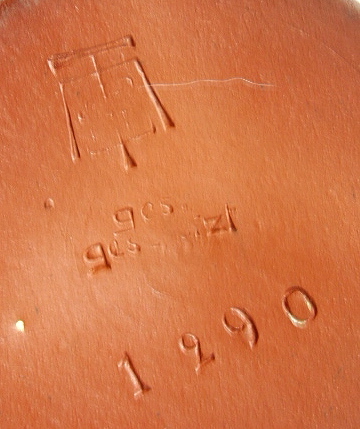 TS Mark Mark on Gray Stoneware Additional marks shown in reference 3. One further mark deserves comment (see right). While “Die Neue Ära” shows the mark on the left as though it were a Dümler and Breiden mark, it actually is the mark of Albin Müller. The one piece shown with this mark is identified as being designed by Albin Müller. The mark, a large “A” over a smaller “M” in a rectangle (a smaller “A” over a smaller “M” in a square), also appears in Keramik-Marken Lexikon cited for the marks in the table above. Müller probably used this mark on steins designed for other firms, too. Mark 5 ▼ – “Die Neue Ära”, see reference citations below. Presumably, the third mark was only used in 1910. The fourth and fifth marks have only been noted on terra sigillata wares. 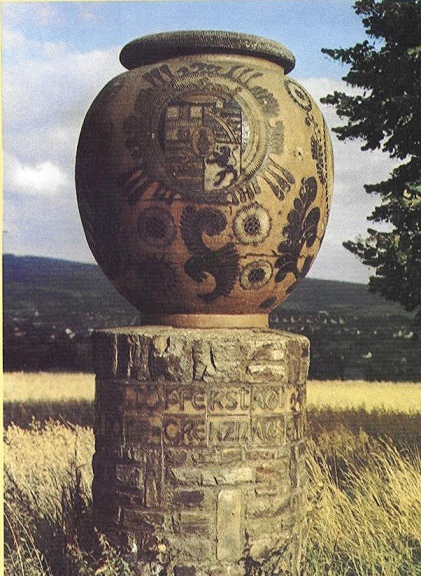 Marks 1-4, “Keramik-Marken Lexikon: Porzellan und Keramik Report 1885-1935 Europa (Festland)” by Dieter Zühlsdorff, published by Arnoldsche in 1994. Above ▲: The Albin Müller monogram as depicted in Die Neue Ära. Below ▼: As shown in Keramik-Marken Lexikon. 1. 100th Anniversary Catalog of Dümler and Breiden published by the firm in 1983. 2. Die Neue Ära: Westerwald Steinzeug Jugendstil und Werkbund 1900-1930 by Jürgen Erlebach and Jürgen Schimanski; published 1987 by Contur Verlag. 3. “Müllches Albert” – http://www.koblenz.de/sehenswertes/erlebt/text98/MuellchesAlbert.htm) While the site is no longer on the Internet, I did save a hard copy for my files. 4. Rip Van Winkle with illustrations: To read the story of Rip Van Winkle, go to http://archive.org/details/ripvanwinkle00irvi and click on Read Online. Just turn the pages by clicking on the right hand side. There are plenty of illustrations. 6. Brexbach Creek: Several scenes along the Brexbach Stream and Burg Grenzau can be seen at this site, http://www.ich-geh-wandern.de/brexbachschluchtweg-westerwald. Unfortunately, I could not find any photos of the old Breiden Mustard Mill. 7. Information on Burg Grenzau and the mill: the site is now gone. 9. Brewery exhibits at World’s Columbian Exposition of 1893: (delete as the site is gone-http://fly.hiwaay.net/~shancock/fair/text/beer.html) Joseph Schlitz Brewing Co. exhibit at the World’s Columbian Exposition of 1893, http://www.slahs.org/schlitz/1893exhibit.htm.